REDUCED! 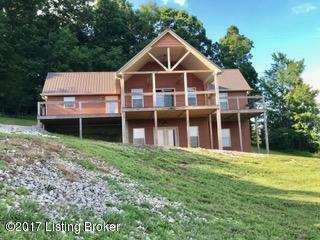 This beautiful custom built home sits on 7.54 scenic acres and is just 1 mile from Nolin State Park. On the mail level of the home, there is a large eat-in kitchen that boasts custom white cabinetry with butcher block counter tops, tile back splash and charming farmhouse sink. In the middle of the kitchen area is a functional movable island. 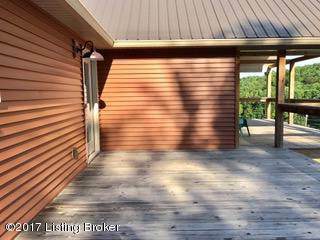 Just off the kitchen is a deck ideal for grilling out. The large living room has a cathedral ceiling and a beautifully finished fireplace. Just above the fireplace is a 55'' LG flat screen TV. 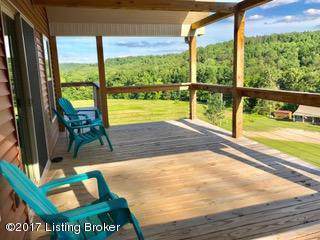 Just off the living area are french doors leading out to a spacious covered deck, ideal for relaxing and winding down after a long day at the lake. 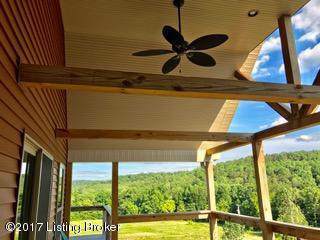 2 bedrooms and 2 baths round off the rest of the level of this home. Just downstairs in thebasement is another bedroom and bath. The rest of the basement is unfinished just waiting for your finishing touch. Furniture, a jet ski, golf cart and gas grill are negotiable. There is a dock to transfer per COE approval and HOA dues and restrictions do apply.